According to legend, the sandwich was invented in 1762 when the Fourth Earl of Sandwich in England demanded his valet bring him meat between two slices of bread so that he could dine without pausing his cribbage game or soiling the cards. Others, the story goes, began ordering “the same as Sandwich.” While no one knows who really was the first to put meat inside bread or pastry, we’ve been doing it since ancient times, and certainly long before the First Earl of Sandwich was a twinkle in his parents’ eyes. More specifically, my nominee is the No. 1 Cali Special “Dac Biet” at Cali Baguette Express(5125 El Cajon Blvd. in City Heights). The combination of the baguette, pickled and julienned daikon and carrot, fresh cilantro and old-world charcuterie is equal parts traditional and exotic, grounded yet exciting. 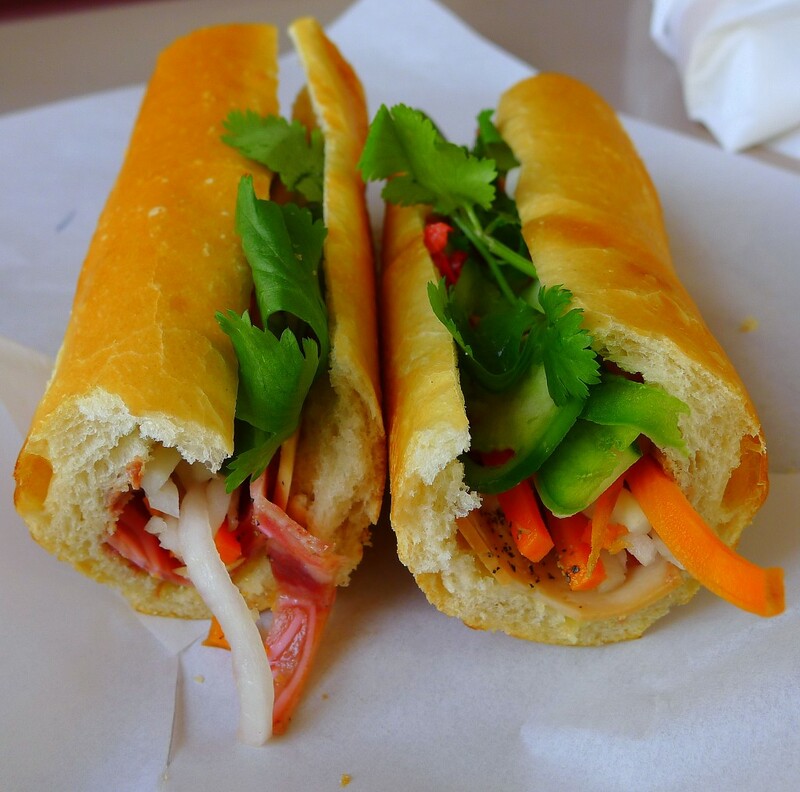 The words “bánh mì” translate to English as “bread.” The term, though, has come to refer to Vietnam’s signature sandwich. The dish consists of a baguette, somewhat fluffier than the French original (at Cali Baguette the bread is baked on premises, which is a plus), stuffed with a protein and generally includes pickled vegetables, fresh cilantro and either mayonnaise or butter. One of Cali Baguette’s best offerings is the No. 6 BBQ pork. The meat filling was excellent, with a savory depth, a hint of sweetness and the nearly Day-Glo red color of Chinese char siu. These flavors play off the acid and sweetness of the pickles, the richness of the butter and the jalapeñoís heat. Less exceptional was the rotisserie chicken. While the meat was tasty enough, the whole was no more than the sum of its parts. Among the better non-sandwich offerings is the bún bò huế, a version of beef noodle soup hailing from Vietnam’s central region, featuring different cuts of beef with rice-vermicelli noodles and an ever-so-slightly spicy broth. While Cali Baguette’s version is not the most intense, its lightness is a positive feature rather than a detriment. Cali Baguette’s combination porridge,cháo thập cẩm, however, seems caught between being a bowl of rice and the Chinese version of rice porridge, congee. While experiencing rice grains individually can be a good thing, it’s far less pleasant in a porridge. But you don’t go to Cali Baguette for the porridge. You go there for the bánh mì and, in particular, the No. 1 Cali Special (available every day). The sweetness and acid of the pickle, on the one hand, and the richness and earthiness of the charcuterie, on the other, elevates this sandwich beyond the ordinary. It’s the leader at the first post in the Best Sandwich on the Planet race.